The 19th-century painter Winslow Homer (1836-1910) is one of the most beloved figures in American art, perhaps most associated with the pastoral beauty of rural America and his dramatic Maine seascapes. 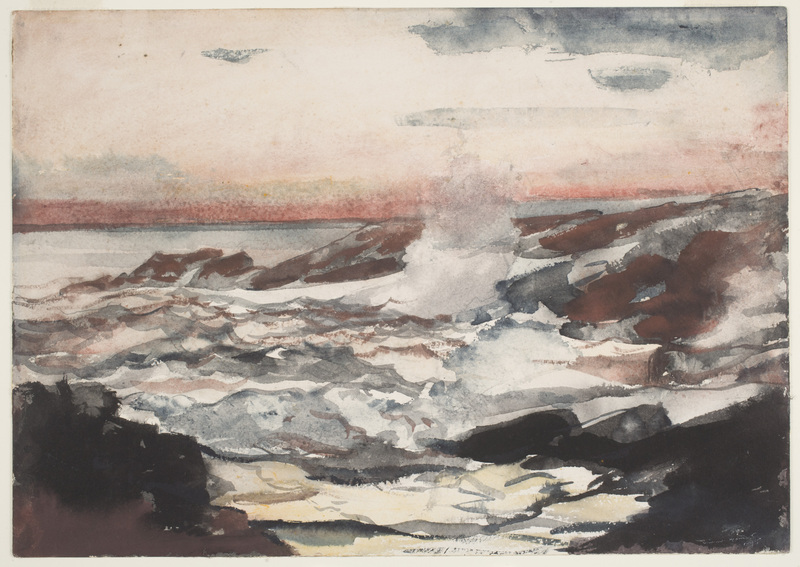 The new exhibition Coming Away: Winslow Homer and England, opened March 1 and on view through May 20, 2018 at the Milwaukee Art Museum, explores how English artists and Homer’s nearly two-year stay in the seaside village of Cullercoats, England, impacted the style and subjects of the artist’s work for the rest of his career. Fifty works by Winslow Homer are featured in the exhibition, including a selection of some of his most famous early scenes of independent farmers and outdoorsmen, as well as women at leisure and mischievous country children at play. Displayed alongside the art that Homer developed while in Cullercoats and the dramatic seascapes that marked his career after he returned to the United States, the exhibition demonstrates the great shift in Homer’s painting that his time in England inspired. Coming Away demonstrates how new influences impacted Homer’s artistic development during and after his stay in England, and how this time exacerbated the tensions he felt between the traditional nature of his subject matter and the modernity of his aesthetic vision. By the 1870s, Homer (1836-1910) had already established himself as a successful artist in the United States, receiving widespread acclaim for his paintings, watercolors, and prints. In March 1881, the artist travelled to England, most likely spurred by the growing interest in British art in the United States as well as the success of his work there (his 1876 painting The Cotton Pickers, - on loan from the Los Angeles County Museum of Art and on view in the exhibition – was a highlight of the 1878 summer exhibition at the Royal Academy of Arts). While in England, Homer engaged with the work of the country’s masters, including Joseph Mallord William Turner and Sir Lawrence Alma-Tadema, as well as with paintings by regional artists from the coastal village of Cullercoats, where he established a studio. He also purchased two cameras at this time, suggesting his interest in contemporary forms of picture making. Musée d’Orsay’s Summer Night; as well as many of the artist’s late seascapes that so deeply influenced American modernists. Also included are paintings by Lawrence Alma-Tadema, George Henry Boughton, Jules Adolphe Breton and Joseph Mallord William Turner—works that show the range of international influences that Homer embraced—alongside English photographs, which Homer consumed and became fascinated with during his stay abroad. “During his lifetime as now, critics celebrated Homer’s work for its honesty and truth to nature, what many believed were quintessentially American qualities, but this exhibition complicates our understanding of Homer as the archetypal American artist,” commented co-curator Brandon Ruud, the Abert Family Curator of American Art, Milwaukee Art Museum. 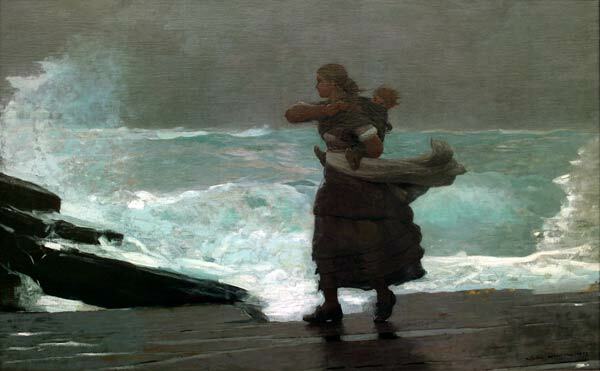 Winslow Homer, Hark! The Lark, 1882, Oil on canvas, Layton Art Collection Inc., Gift of Frederick Layton, at the Milwaukee Art Museum, L99. Image courtesy of Milwaukee Art Museum/Photography by John R. Glemblin. 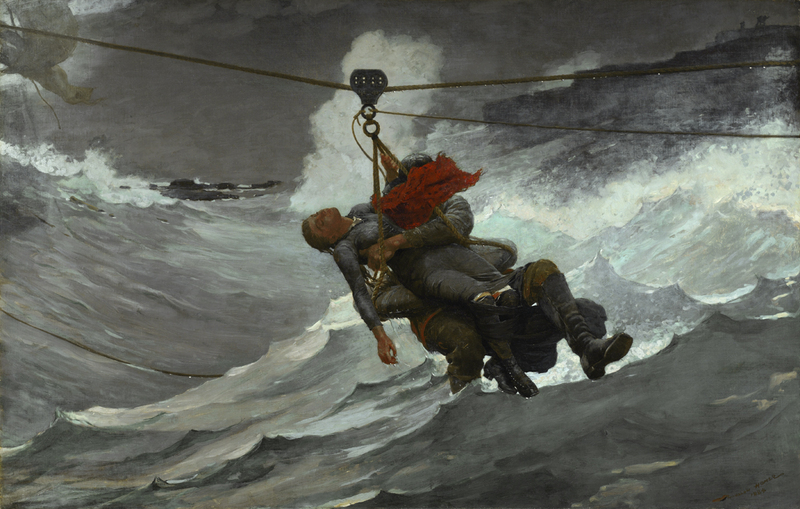 and The Gale, in the permanent collection at the Worcester Art Museum. Homer began his composition for The Gale while in Cullercoats and spent the next decade of his life perfecting the painting as he wrestled with his aesthetic vision and artistic legacy, a testament to his craftsmanship and England’s lasting influences. As early as 1873, Homer began studying color theory and watercolor practice. Throughout the 1870s and especially during his stay in Cullercoats, Homer favored English paints and papers and often experimented with English techniques, such as blotting away color to reveal white paper underneath. Coming Away is a rare opportunity to see many of the artist’s watercolors from this period exhibited together, presenting the progression of his watercolor technique over time. 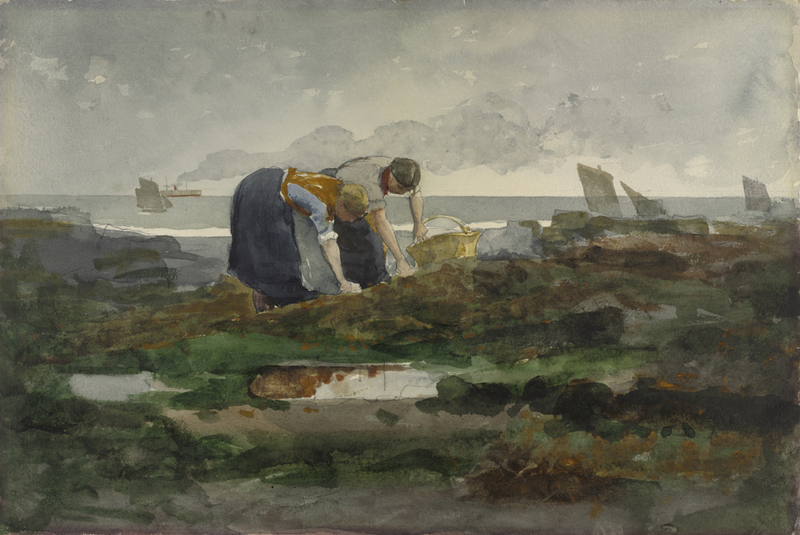 Winslow Homer, The Mussel Gatherers, 1881-81, transparent and opaque watercolor over graphite, Baltimore Museum of Art, Gift of Alvin and Fanny B. Thalheimer, 1956.226, Image courtesy of The Baltimore Museum of Art/Photography by Mitro Hood. and English Coastal Scene (1883). “These two important works that bookend Homer’s Cullercoats period provide the perfect opportunity to explore the artist anew and show just how pivotal England was to the artist’s development,” said Elizabeth Athens, co-curator from the Worcester Art Museum, presently at the National Gallery of Art. First shown to the public from November 11, 2017 to February 4, 2018 at the Worcester Art Museum, the exhibition was warmly received by East Coast audiences. 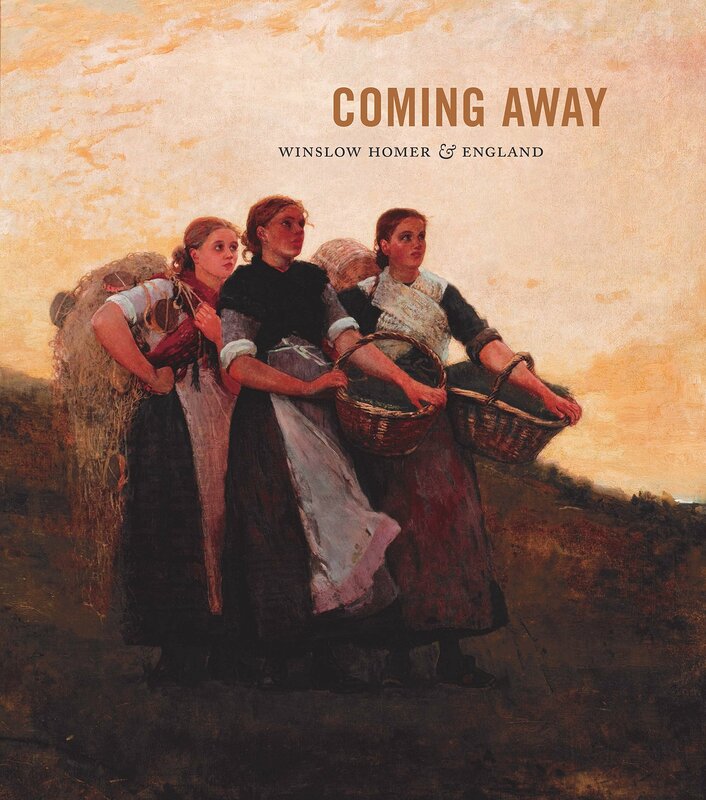 The accompanying hardcover catalogue Coming Away: Winslow Homer and England is co-published by Yale University Press, the Worcester Art Museum and the Milwaukee Art Museum. This beautifully designed and produced publication explores Homer’s time in England and how it influenced his art, as he attempted to reconcile his affinity for traditional subject matter with his increasingly modern aesthetic vision. The eighteen months Homer spent in England in 1881 and 1882—studying the work of masters such as J. M. W. Turner and Lawrence Alma-Tadema, and exploring the landscape of coastal villages—irrevocably shaped his creative identity. Coming Away complicates our understanding of his work and convincingly argues that it has more cosmopolitan underpinnings than previously thought. 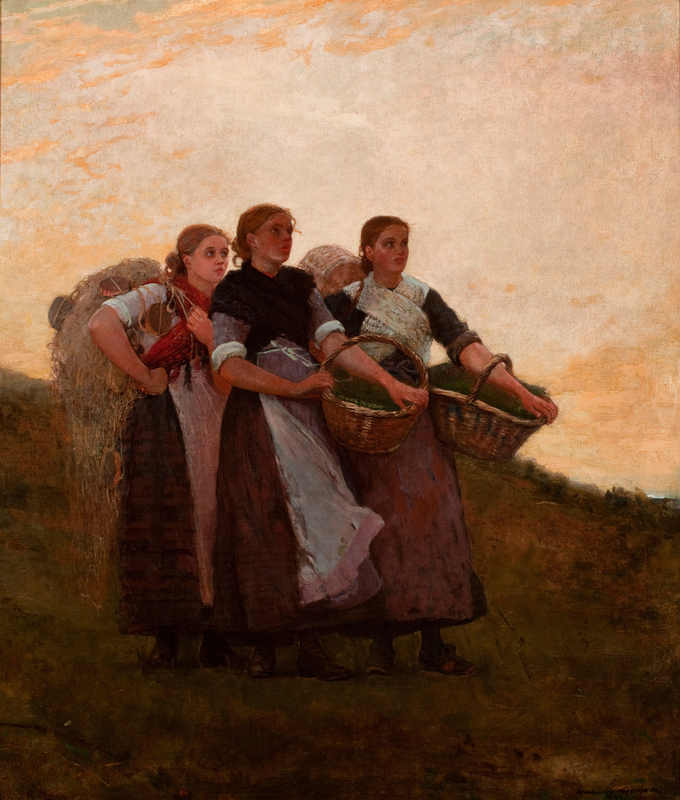 The exhibition Coming Away: Winslow Homer and England is co-organized by the Milwaukee Art Museum and Worcester Art Museum.